ORRVILLE, Ohio, – Eagle Brand® announces two NEW flavor varieties that are available throughout the holiday baking season. The New Chocolate and Caramel Flavored Sweetened Condensed Milk varieties are made with flavors guaranteed to add excitement to your favorite traditional holiday baking. To help inspire creativity in the kitchen this season, Eagle Brand has released a series of delicious recipes on its website that utilize the new Chocolate and Caramel flavored varieties. The recipes include decadent selections like Salted Caramel Pretzel Cheesecake and Fluffy Chocolate Magic Cookie Pie that can sweeten any family gathering. With two limited edition flavors, easy-to-follow instructions and all the classic sweet flavors of Eagle Brand Sweetened Condensed Milk, families are in for a treat this holiday season! 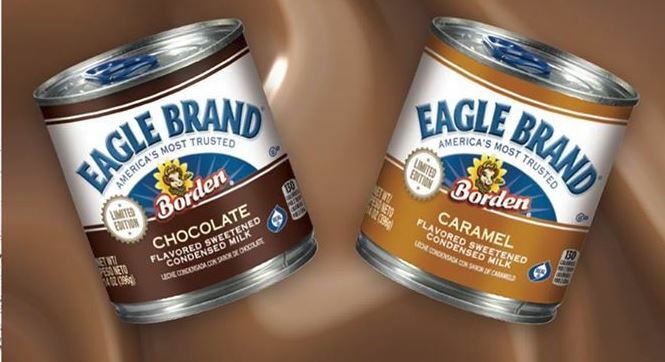 Eagle Brand Sweetened Condensed Milk is available at retailers nationwide including Kroger and Wal-Mart for a suggested retail price of $1.99. Visit EagleBrand.com or find Eagle Brand on Facebook for more delicious holiday dessert recipes, perfect pairings and helpful baking and entertaining tips.